Whether your kitchen's on the smaller side and what worktop space you have is treasured or you live on your own so don't need big appliances, a small microwave is a handy appliance to have. An easy way to keep your kitchen from looking cluttered and it'll cook your dinner in minutes after you've had a long day. Here, we take a look at the best compact microwaves so you can find the right one for you. Not found what you want? Check out our full list of the best microwave ovens. On the hunt for more kitchen appliance recommendations? Head to our appliances hub page for plenty of advice. What is the best small microwave? A great all-rounder, the Russell Hobbs Aura RHM2079A tops our list of the best small microwaves. At just 20 centimetres high and 30 centimetres deep and wide, the 20-litre microwave is simple to use, easy to clean and it looks pretty great on a kitchen counter, too. Every kitchen benefits from a microwave, even if it’s a small model. The biggest consideration? Its power: anything less than 700W and you may as well use the oven. But if you’re looking for a microwave to cook food fast with oven quality taste, opt for one with 800 or 900W, such as the Samsung F300G microwave. If power is what you’re after then you can expect good things from this commercial microwave oven. It’s the largest on the list, but still smaller than many microwaves, making it ideal for kitchens that have limited work surface space. It heats up food quickly with no complicated buttons or dials to slow down the process, it's surprisingly lightweight and, thanks to its simple styling, it suits most styles of kitchen. One of the best compact microwaves you can buy if you're after something high powered. 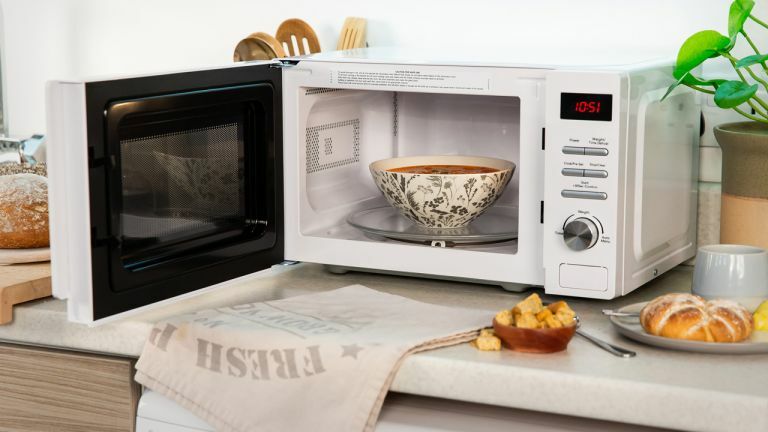 The style-conscious will love this retro-looking compact microwave from Swan. It comes in a range of different colours, and it’s one of the smallest on the list. It has a 20ltrs capacity but, despite its size, it packs a punch when it comes to power. It features a range of settings for different temperatures and even for defrosting food, with a 60 minute digital timer for ease of use. The turntable provides even heat distribution when warming up meals so you can expect quick and easy cooking in this microwave. The best small microwave for those going for a retro look in their kitchen, we think. Available in black, cream, red or rose gold, the Russell Hobbs RHMM701C is our pick of the best small microwave for those after a stylish addition to their kitchen worktop. Its cute, retro design might be just what you’re looking for if you like the look of the Swan but still think it’s a little too bulky for your kitchen, seeing as it's smaller in height and depth. It’s one of least powerful picks on our list, but users have said it’s great for reheating dishes as and when needed, and could make a good choice of microwave for a studio flat or maisonette. The glass plate is 25cm in diameter, which should accommodate most standard dinner plates. If you have a busy lifestyle and don’t have time to cook complicated recipes from scratch, this Panasonic microwave is the best compact microwave for you. It is a combination microwave and 1000W grill, with nine auto programs and five power levels that allow you to quickly and easily reheat meals or prepare hot snacks. It’s small enough that it won’t take up too much room on your kitchen counter, but powerful enough to cook a range of dishes quickly and thoroughly. This Hotpoint microwave is the smallest on our list, operating at 700W of power and holding a capacity of 13ltrs. It might be the smallest microwave on our list in terms of height as it comes in at a tiny 17cm tall, however, what it lacks in height it certainly doesn't lack in features. Multiwave technology ensures food is evenly cooked throughout, and it has five power levels and five auto-defrost programmes including meat, fish, poultry, vegetables and bread. Its curved design makes it perfect for storing in a kitchen corner, and it features a sleek touch control to operate. Our pick of the best small microwave for those short on worktop space.